One of the memorable sequences in Gulzar’s Parichay was towards the end; when the patriarch Grandfather (Pran) realizes that love exist between his grand-daughter (Jaya Bhaduri) & the hero (Jeetendra). The scene was so effectively portrayed with Jaya maintaining a telling ‘silence’ when Pran had asked her a question or two about Jeetendra. The scene shows how dialogue can be dispensed with in the cinemas & still be able to convey exactly the same feeling/statement what could have been done with usage of dialogues. In 'Chak De' an early sequence which depicts anguish of losing a hockey match is effectively conveyed with the strain of musical notes and images, drowning out the roar of the crowd. The silent films of yesteryears, from Chaplin to the works of Buster Keaton, communicated effectively to audiences - just images embedded in a silent frame has been used to communicate with the audience. Basic to Buddhadeb Dasgupta's first film DOORATWA is the distance between Anjali and Mandar a distance which the camera establishes quite early in the film when Mandar steps out from a tea house onto the street as an Anglo Indian woman (incidentally representing a culture somewhat remote from Mandar’s) passes by. His eyes follow her as she merges into the distance; Anjali appears and comes towards him. The distance is narrowed and dissolved as the two briefly exchange greetings, and then the camera, through Mandar’s eyes, follows Anjali as she gradually moves into a long shot in the central background. Thus the separation between them is visually established . Recently in Bollywood, Ramgopal Verma's SARKAR used sparse dialogue, dimly lit frames and muted communication techniques to build the haunting mood of this 'Godfather' inspired film. In Dibakar Banerjee's OYE LUCKY, LUCKY OYE sequence of ‘stills’ have been used intermittently, while a series of soundless images punctuated by a twinkle sound appears as a rather unique and inventive narrative technique. The mood and color of the film oscillates between bright and dark, so apt for a film based on the character of a sharp mind criminal. Imaginative camera techniques have been used to convey the mental state of the protagonist. In the film BHUVAN SHOME, Mrinal Sen and cameraman K.K. Mahajan used a close up and thereafter a long shot and repeat the pattern creating a joyful sequence of the protagonist Suhasini Mulay on a swing. 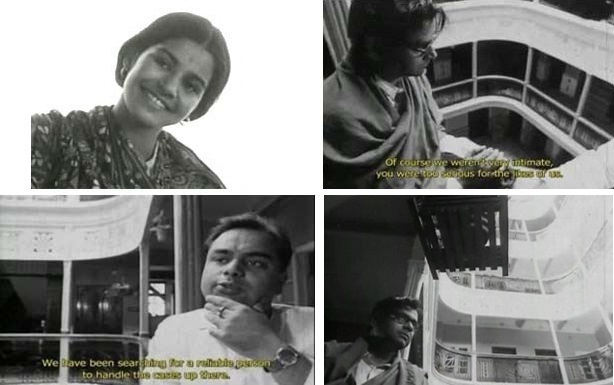 In Ritwik Ghatak's SUBARNAREKHA, Ishwar, a village teacher, depressed over his lowly status as a migrant, runs into a college classmate, now a wealthy businessman who offers him a job. Note how the angle on Ishwar shifts dramatically across the reverse shot at the moment he is offered the position. SUBARNAREKHA is rife with such angular shots and effectively communicates with the audience in conveying the Director's thought behind the frame. Symbolism can also be used to communicate the progression of the story. The smashing of an ant by the villain Gabbar Singh communicated the killing of a village lad (Sachin) in SHOLAY, while the extinguishing light of a diya has been used as a symbol to show the death sequence of Pahari Sanyal (father of the heroine Sharmila Tagore) in the film ARADHANA. In BARIWALI, Rituparno Ghosh beautifully conveys the loneliness of Banalata (Kiron Kher) and her attraction towards Deepankar (Chiranjit.) Deepnakar's entry in the film appears in the following manner - the electricity goes off in the house, there appears to be some problem in the power switch board, Deepankar who is meeting Banalata for the first time sees Banalata struggling with the switch board & offers to fix it and yes, he brings light into the house and Banalata's life. In the film AAKROSH directed by Gobind Nihalani, Om Puri in a pivotal role doesn't speak a single word throughout the movie. Yet he conveys so much with eye expression that it ought to rank as one of the greatest performances given by any actor in the Indian cinemas. In SHOLAY, the wordless romance between Amitabh and Jaya is sheer poetry and gives it a sublime quality, and any insertion of dialogues between them would have diluted the beauty of the unspoken love portrayed so effectively. Dialogues generally heighten the melodramatic elements of cinema. Can we imagine some of Amitabh’s blockbusters like Deewar without his forceful dialogues? Would such films like Satyajit Ray’s HIRAK RAJAR DESHE or Amol Palekar’s THODASA ROMANI HO JAYEN have the same charm sans the brilliant use of words? In the final analysis, Cinema is mostly a visual medium. When we see the films of Gautam Ghose, we are often captivated by the cinematography of his films. Several offbeat filmmakers have attempted to convey their stories and its progression onscreen differently (some of which have been outlined above). Through such experimentation, the medium continually evolves and motivates future generation filmmakers to creatively build their product, raising the bar for cinema in the days to come.